In the latest skirmish with American Honda Motor Co. over defective Honda Civic Hybrids (MY 2003 – 2009), the class action trial judge in San Diego Superior Court is set to decide if the proposed settlement is fair. 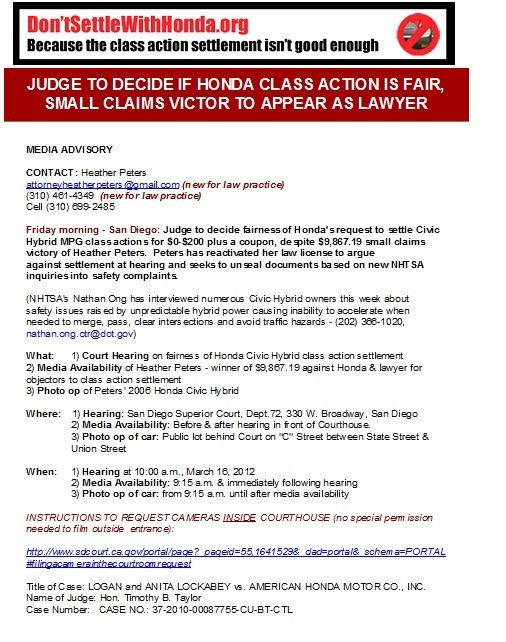 Heather Peters, the woman who sued Honda in Small Claims Court and won nearly $10,000, has reactivated her law license in order to argue against the proposed settlement ($100 – $200 plus a discount voucher up to $1,000 for the purchase or lease of a new Honda or Acura vehicle). We first covered the case here and the decision here. Ms. Peters is convincing and savvy at getting national and international media attention in this “average consumer” versus the deep-pocketed corporate giant case. It’s my personal belief that the proposed settlement is woefully inadequate and this new tactic – taking big corporations to Small Claim Court – may mark a new strategy for normal people to get fairer settlements for defective products. Ms. Peters’ case is being closely followed by all interested parties – other angry and disillusioned Honda Civic Hybrid owners, big corporate interests and trial attorneys. I’m sure there will be major media coverage of the court hearing tomorrow, March 16, 2012. Below is her media alert and the details. The PDF of the email follows the image.